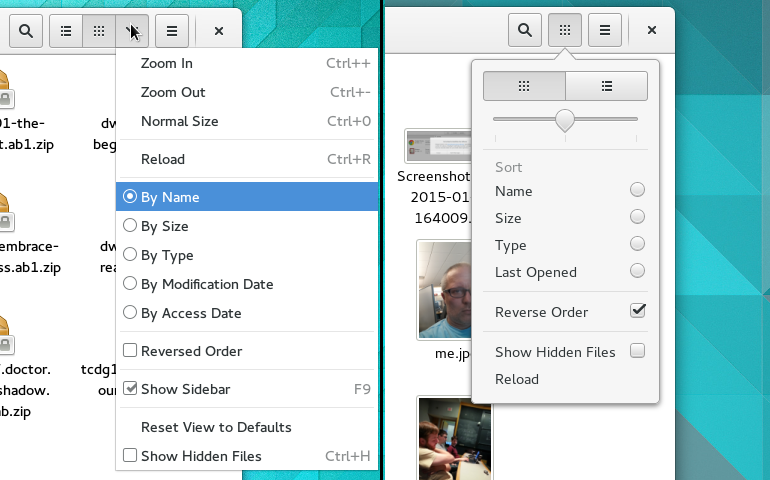 GNOME designer Allan Day posted a very nice article to highlight some of the upcoming changes for GNOME 3.16. Read Allan's article for more screenshots. Allan credits Florian and Jon for redesigning the new notification feature. In previous versions of GNOME 3, notifications appeared at the bottom of the screen. The challenge that Florian and Jon addressed is missed notifications. Allan explains: "One of the key goals for the notifications redesign was to provide an effective way to review previous notifications. In this way, notifications can be used to find out about what has happened in the past, as well as what is happening right now." While I haven't reviewed notifications as part of my usability testing, my heuristic evaluation is that the new notifications design will improve the usability around notifications. I believe most users will see the new grouping of notifications with calendar events as making a lot of sense. My contributions to GNOME have purely been on the usability side. I performed two usability tests: one using GNOME 3.4, and another using a mix of 3.10 and 3.12. I am also currently mentoring another usability test via the GNOME Outreach Program for Women. So I was very pleased to see a post from mclasen about GNOME 3.16 sightings. Mclasen writes about "testing of the GNOME 3.15.90 release.Since we are entering feature freeze with the .90 release, these pictures give some impression of whats in store for GNOME 3.16." From mclasen's screenshots, the new GNOME has several user interface tweaks that certainly give a very clean and sharp look to the GNOME desktop. Buttons seem well-defined, window borders are clear, and the application menu in the top bar seems to have received some attention with updated icon handling. I like that notifications have moved from the bottom of the screen to the top. Mclasen writes: "Notifications are now appearing at the top of the screen. The message tray is gone, old notifications can now be found in the calendar popup." I believe this is a good change to improve usability. Western users use interfaces from left-to-right and top-to-bottom, so the bottom-right (where notifications currently appear in GNOME) are often missed. I'm sure many users don't see important notifications because they appeared at the bottom. In other changes: "The ‘gear’ menu has been replaced by a popover, the list appearance is improved, and file deletion can now be undone from a notification [in the Nautilus file manager]." In truth, the gear menu was removed from GNOME in a previous iteration. I have mixed feelings about GNOME's gear menu, which I'll summarize by saying it was probably mis-used in GNOME. In my usability tests, testers referred to the gear menu as the “options” or “settings” menu because of a previous affiliation with the gear icon and “settings” in other Mac OS X and Windows applications. When asked to change the default font in gedit, for example, testers typically looked for a “font” or “text” action under the gear menu. Users expected that changing the font was an option in the program, and therefore searched for a “font” action under an “options” menu, which they interpreted as the gear menu. 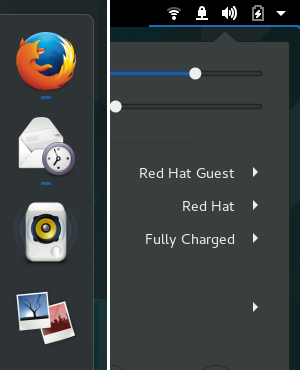 After my usability feedback, GNOME removed the gear menu and replaced it with the "three lines" icon to indicate a menu. The "three lines" icon is a better representation. I would have kept the "gear" icon but moved it to represent a "settings" function. However, I do have some reservations about the updated GNOME. For one, I dislike the darker colors seen in these screenshots. Users don't like dark desktop colors. In user interface design, colors also affect the mood of an application. As seen in this comparison, users perceived the darker colors used in Windows and GNOME as moody, while the lighter colors used in MacOS X suggest an airy, friendly interface. This may be why users at large perceive the GNOME desktop to have poor usability, despite usability testing showing otherwise. The dark, moody colors used in GNOME provoke feelings of tension and insecurity, which influence the user's perception of poor usability. I recommend that GNOME adopt lighter colors in future releases. Avoid dark colors, especially in backgrounds or the desktop wallpaper. Embrace light, airy colors in the interface instead of these somber, melancholy color tones. By adjusting the color theme, GNOME can influence how users perceive the usability of GNOME without further changes to the interface or design. In short, the new GNOME 3.15.90 looks pretty good, but I would like GNOME to update the default theme to use lighter colors. Perhaps it is time to revert to the black on light grey interface used in GNOME 2. 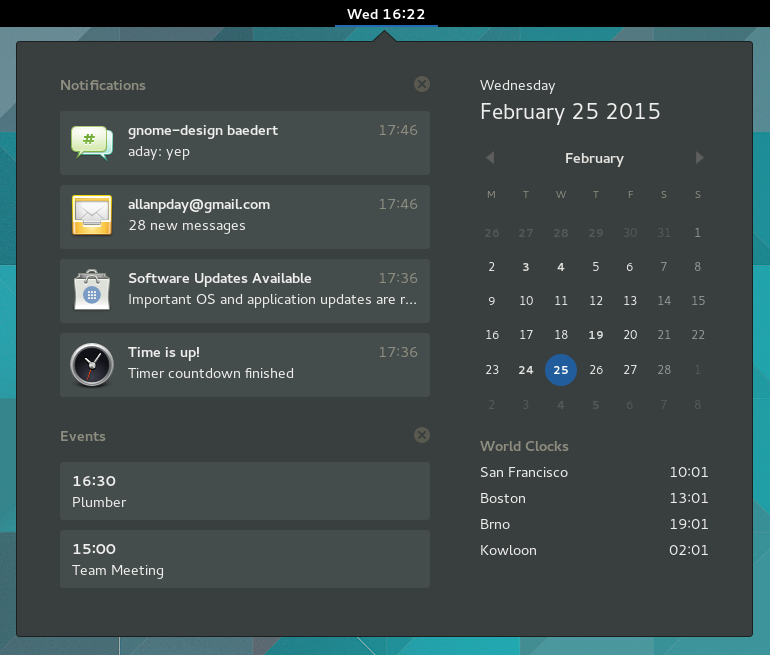 Aside from colors, I look forward to GNOME 3.16. And of course, more usability testing in the new release! I wrote an article for Linux Journal about the usability of GNOME, based on my usability research. 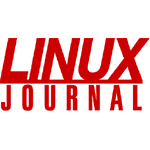 Linux Journal has now posted the article online for you to read: The Usability of GNOME. I recently spoke at GUADEC, the GNOME Users And Developers European Conference, and I opened my presentation with a reminder that GNOME is competing for mind share with other systems that are fairly easy for most people to use: Mac, iPad, Windows and Chromebook. So for GNOME to continue to be successful, it needs to be easy for everyone to use—experts and newcomers alike. And, that's where usability comes in. Please read the article and leave a comment! I plan to continue writing follow-up articles about usability testing, possibly looking at other, similar venues such as Linux Voice magazine. If you have suggestions for other places that would be interested in articles about usability in open source software, please let me know!